Studio Cop Sharing : Post production by Adobe premiere pro. Studio Cop : Sharing, how to use Adobe premiere pro to create movie, Post production 18 Nov, 2016. At studio media center. แบบบันทึกการแลกเปลี่ยนเรียนรู้ (KM) เรื่อง การใช้โปรแกรมตัดต่อวีดีโอ Adobe Premiere Pro : หลักการสร้างภาพยนตร์ Post – Production ของชุมชนนักปฏิบัติสตูดิโอ (Studio Media) วันศุกร์ ที่ ๑๘ พฤศจิกายน พ.ศ. ๒๕๕๙ เวลา ๑๑.๐๐ – ๑๒.๐๐ น.
Jidlada Technical College study visit ARIT to exchange experience. On 13 January 2559. Asst. Prof. Fuangfah Mekkriengkrai, Vice-President for Academic Affairs and Research of RMUTP, award for best KM Website and best practice of the year 2015 to ARIT staff –Ms.Petcharaporn Petchkeaw and Mr.Sompoach Kultrararom–. 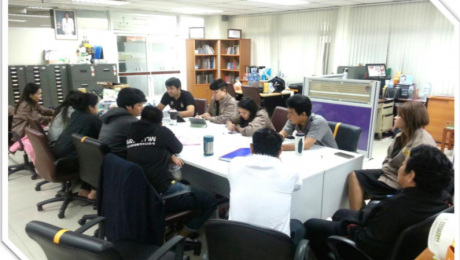 The event was held in September, 2015 at Rapheephat conference room, Office of the President, Rajamangala University of Technology Phra Nakhon (RMUTP). DevExpress knowledge transfer from Mr.Sompoach Kultrararom to his subordinate. Writing effective code for building better system in September 2015, at Software group ARIT, Dhevej, Bangkok 10300. Sompoach Kultralarom trains members group of Software to write code with ASP.Net on July,21-24, 2015. At ARIT, Dhevej, Bangkok. Sharing how to write ASP.Net project among programmers in IT Group on 9/12/2014. At ARIT Thewest. ARIT operate Mind Map training project for RMUTP manager on 8th March and 18th April 2014 at the Office of Academic Resources and Information Technology, Dhewest center. There are 99 people sign in 3 classes. They are enjoy learning new program. This program can help them improve quality of their work. Student from Jitlada college study visit management of computer network of RMUTP at ARIT on Febrauary 6, 2014. Quality assurance board of Huachiew Chalermprakiet University study visit QA of RMUTP at ARIT on December 20, 2013.